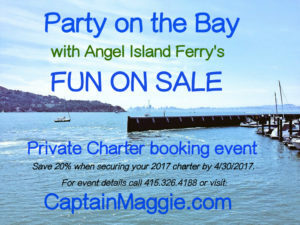 Introducing Angel Island Ferry’s “FUN ON SALE” Private Charter incentive event. Everyone loves a good party. Make your next celebration a fun and memorable event with an Angel Island Ferry Private Charter on San Francisco Bay. Book your 2017 private charter by April 30, 2017, and SAVE 20% off Angel Island Ferry’s Private Charter base rates. When booking, please mention code: Charter20. For example, Angel Island Ferry charters regularly book at $900/Hour base rate with a 2 hour minimum ($1,800.00 for 2 hours). Your “FUN ON SALE” base rate is $720/Hour ($1,540.00 for 2 hours). Keep in mind, you are welcome to book a private charter longer than 2 hours, we are providing the above estimate off our 2-hour private charter minimum. Plan your party on the bay with our “Fun on Sale” event. Create a one-of-a-kind party on the bay…your way. Plan a private party boat cruise along the San Francisco waterfront, circle Alcatraz Island, cruise to McCovey Cove to catch a SF Giants home game…or sail into the sunset (literally) on your own private Sunset Cruise to the Golden Gate Bridge. These are just a few suggestions, it’s up to you where you want to plan your fun on the bay. When it comes to planning your special event on San Francisco Bay, Captain Maggie McDonogh says, “Your only limitation is your imagination”. In order to take advantage of our “Fun on Sale” event, charters must take place during the 2017 calendar year and be secured with a deposit by April 30, 2017. Blackout dates apply. Please email aiferry@angelislandferry.com for more info., or call our Private Charter hotline at: 415.326.4188 for a call back within 24 hours. Angel Island Ferry, party, party boat rentals, party boats sf, party on bay, party on the bay, private charters san francisco, private charters sf.